Distinguising Features: grill flush with wings; plastic, slatted grill; headlights recessed and in the wings; one piece windshield; eyebrows (asa wheel arch extenders); steering arm connteced to the middle of the swivel pin assembly; bulged sides; square doors. 110 and 130 are just long wheelbase versions of the 90. Pre 1988 Land Rovers had galvanized bumpers. 1988 and later Land Rovers and Defenders had black powder coated bumpers. 1983-1989 Land Rovers have a sign just above the grill and below the bonnet (hood) that reads "Land Rover" and it's wheel base (ie "Land Rover 110"). 1990 Land Rovers have signs in the same place that just list it's wheel base (ie "110"). From 1991 to the present the sign reads "Defender". 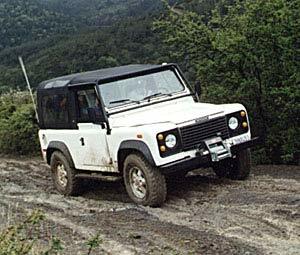 In Autumn 1990 the name of these models were changed from Land Rover to Defender. 14 guage steel boxed "ladder" design frame, Aluminum body (with steel scuttle) bolted directly to chassis frame. 14 guage steel boxed "ladder" design frame, Aluminum body bolted directly to chassis frame. Coil springs, radius arms and Panhard rod, anti-sway bar.